Drug Search and Seizure: Evidence Suppression | South Carolina Personal Injury Attorneys | Criminal Defense Lawyers - Strom Law Firm, L.L.C. Drug cases in South Carolina have serious consequences. The criminal defense lawyers at the Strom Law Firm L.L.C. handle all types of drug cases, from Simple Possession of Marijuana to Conspiracy to Traffic in large quantities of illegal narcotics. Contact the drug crimes attorneys at the Strom Law Firm today for a free consultation to review the facts of your case. Reviewing whether an illegal search and seizure took place is an essential part of your defense. 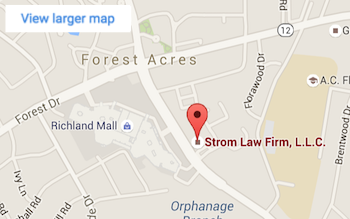 The Strom Law Firm, L.L.C. always evaluates whether or not law enforcement properly conducted a search and seizure and will request and analyze all of the evidence to determine how to present the most effective defense possible. If you were arrested for drugs and your search was conducted as a result of an unlawful stop, illegal search warrant, unreasonable search, or you were simply present where drugs were found, We will renew the evidence in your case, discuss the legality of the search with you and file any necessary evidentiary motions. • whether the officer had probable cause to search. We understand the importance of your case and we will fight to protect your Fourth Amendment rights. The Strom Law Firm L.L.C.’s familiarity with prosecutorial techniques and knowledge of criminal law ensures that you will receive a vigorous, well-planned criminal defense. Founded in 1996 by former United States Attorney and Richland County Assistant Solicitor, Pete Strom, the lawyers at the Strom Law Firm, LLC, are ready to fight for your interest. At the Strom Law Firm, LLC our attorneys are dedicated to protecting the rights of our clients and providing aggressive representation for your case. We know the system, we understand the law, and we will provide an aggressive defense. We offer a no cost consultation with one of our drug defense attorneys. Call us today to discuss your arrest, how to determine the evidence against you, as well as possible defenses.